Download the program immediately and test it during the next 60 days free of charge. When registering it after the 60 days period you will have to pay USD 130. All entered data of the trial period are stored when you buy a license. Do you want to get more information about T@imeCalc? 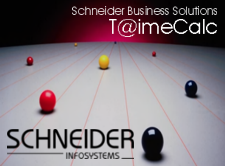 Please contact us: info@schneider-infosys.ch.